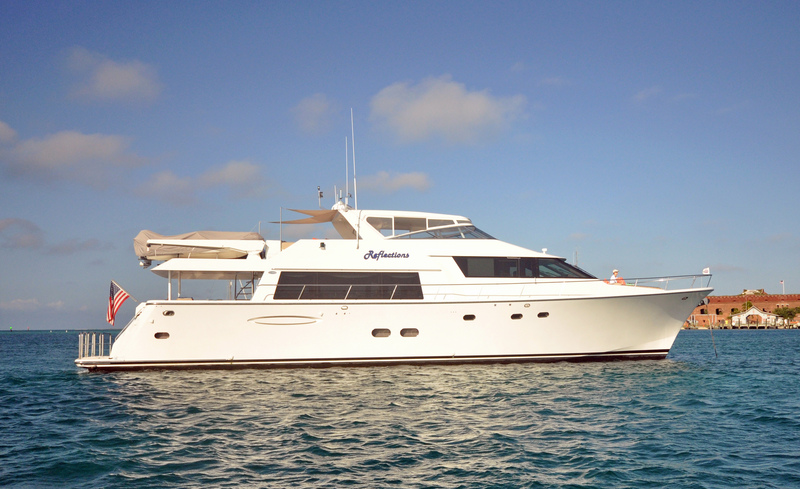 RJC Yacht Sales & Charters announces the sale of the 85' Pacific Mariner, REFLECTIONS! RJC Yacht Sales is pleased to announce the sale and closing of the 85' 2005 Pacific Mariner, REFLECTIONS. Raymond Young at RJC Yachts represented the seller and Mark Peck at Westport Yacht Sales represented the buyer. Built in GRP by US yard Pacific Mariner to a design by Gregory C Marshall, she was delivered in 2004 and had comprehensive interior refit in 2014/2015 giving her new carpets, upholstery, soft goods and wall coverings. A popular charter yacht, she sleeps up to nine guests in four cabins. A full beam master suite amidships features an en suite bathroom with oversized Jacuzzi tub and shower, while two double cabins come with queen-size beds and en suite facilities. there is also a twin cabin with an en suite bath, and all cabuns come with individual entertainment systems. Twin 1,500hp MYU diesel engines giver her cruising speed of 20 knots and she is fitted with Naiad zero speed stabilizers to minimize roll motion at sea and in port.